Board Gender Diversity has moved up the agenda. In part fuelled by the ‘Me Too’ campaign which has caught the public attention and encouraged us to think about the wider representation of women in the world of work and how these things have been allowed to fester. Board gender diversity is a ‘tricky one', in part because it forces us to consider the means by which we might make gender representation fairer but also because once you begin to address gender representation, then you have to consider all forms of under-representation at board level. Ethnicity is just one example. For the purpose of this blog, however, I am going to focus on gender. Let's, first of all, consider how gender diversity is gathering momentum as a topic for boards. Most companies in the UK and the US, with a calendar year end, will hold their AGMs during the months of April to June; this is known as 'proxy season'. Shareholders have an opportunity to put shareholder proposals to boards and it is probably no surprise that gender diversity as a subject is gathering momentum, given its dominance in the news agenda in recent years. In 2017 in the States, there were two shareholder proposals on board diversity that received majority shareholder support; Cognex Corporation and Hudson Pacific Properties. They each enjoyed a substantial margin of victory with 63% and 85% respectively in favour of the bill. In addition to these, we had State Street Global Advisors and Blackrock Inc. casting votes against directors on corporate boards that lacked diversity. We stand in sixth place in the international ranking, with all of the countries ahead of us, having largely introduced legislative quota regimes. Their findings reveal that the proportion of female employees decreases with seniority in two-thirds (67%) of organisations and just three in ten (31%) have taken action to improve the gender diversity of their board. In addition, a lot of the statistics of gender representation in boardrooms do not distinguish between main board members and executive board members. There is a significant difference. 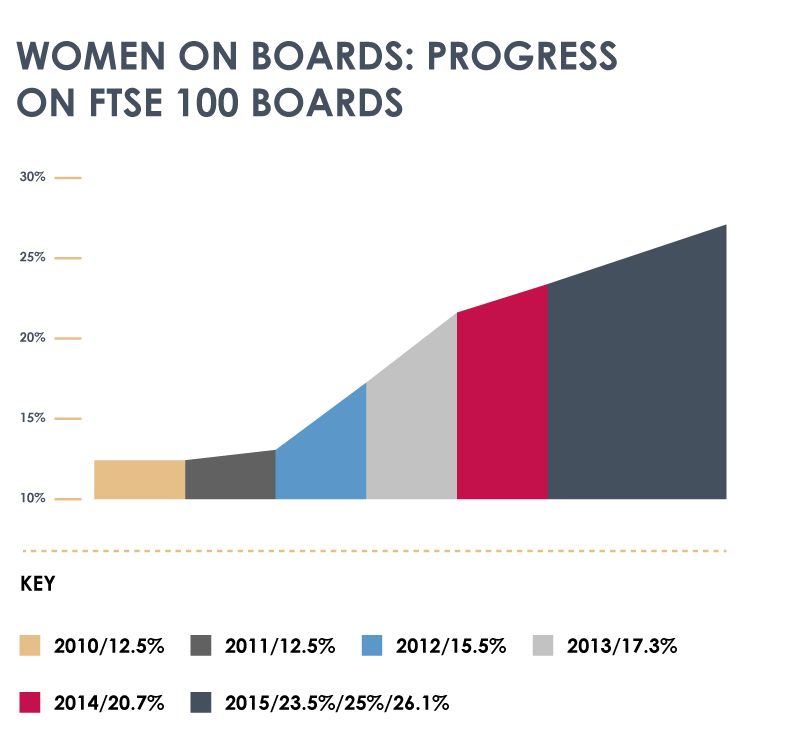 The CIPD produced a report in 2015 which looked closely at this very topic making the point that whilst substantial gains had been made in the area of non-executive directors, female representation of executive directors remained stubbornly low. Interestingly too, of the 452 HR members they surveyed for this report, they still had 44 % of respondents who had not heard of the Davies initiative! The other aspect I wanted to consider is how we achieve the goals of a truly diverse boardroom. Whilst a raft of measures have been put forward and some clearly employed, there is one measure that surfaces repeatedly: that of diversity quotas. Surprisingly, diversity quotas are met with considerable resistance from the very people they are championing – women. Research conducted by BoardAgenda.com from 50 women across 5 different countries showed considerable resistance to the idea of diversity quotas, arguing that they felt this would undermine the achievements of women who have ‘bust a gut' to get to where they are. In other words, female directors are quite protective of their positions. The suggestion is that our current female directors may unintentionally be helping to fuel the current low-level gender diversity status quo. The Australian government’s approach to Boardroom gender diversity takes the most refreshingly bold and uncompromising approach to tackling this issue. Instead of having representational targets like other nations, the only objective Australians set is how many women they prepare for boards. The Australian ICD identified 50 top Chairmen and assigned them two people to mentor. These were mentored to become outstanding directors of the future. The Australians avoided an approach that stated: "if we get more women on board, we have diversity". Instead, they took the pragmatic step of creating diversity of thinking. ‘Female progression to top roles is not sustainable unless organisations provide a strong and sustainable framework to recruit and develop women at every stage of their career. So in summary, whilst the sound bite of ‘board gender diversity' might hit the headlines and even be gathering momentum, the real work needs to be done at the grassroots of every organisation. We need to take a much more holistic approach to building a strong and sustainable talent pipeline. The recent research I have been doing shows that feedback is infused with unconscious bias and therefore negatively impacts on women’s progression routes in organisations, and my recommendations should be a helpful tool in this regard. I have launched my #FeedbackFirst campaign as a result of my findings; specifically designed to help organisations understand how to position gender equal feedback as part of diversity agendas as well as a business case ‘hard measure’ issue. This will give maximum development and leadership opportunities to an organisation’s talent pool. Visit my #FeedbackFirst page to download the ebook.